Harold Jacobs was born in Port Chester, N.Y. in 1917, and was educated at Johns Hopkins University (BA) and New York University (MS and PhD). He began his professional career in 1942 on the radar tube, war production lines of RCA, and in 1945 he went to Sylvania Electric Corporation doing research on cathodes and gas discharges. He joined the US Army Signal Corps Laboratory at Ft. Monmouth, N.J. in 1949 and was employed as a physicist and senior scientist. Among his earliest contributions, he developed the magnesium oxide cold cathode requiring no filamentary heating (of continuing interest today for display and TV tube adaptation). Concurrently, the rapidly expanding field of solid state devices took new life at the Army Laboratory under Dr. Jacobs' leadership, culminating in the Army's official assignment to his group of the responsibility for the next eight years for "pump-priming" the US development and production capability for new transistor families on behalf of the DOD. His assiduous research at this time convinced him that silicon, though refractory, has unlimited potential as a next generation transistor material, and he was the first to so patent, publish and act on his conclusions; the subsequent development of the silicon transistor is history. By 1960 the impact of "solid state" areas on microelectronics and microwave devices opened vast new potentials for the military. This and the introduction of the practical laser again re-oriented the prime thrust of his device research, this time into the microwave, millimeter, submillimeter and optical portions of the spectrum. His work on power laser amplifiers, laser modulators and on imaging using solid state modulation approaches represented pioneering efforts with the new technologies. A new imaging concept was evolved using millimeter/submillimeter devices. It is currently being explored for radiometry applications and for short range weapon detection. His most recent contribution involves the concept of "Millimeter Wave Integrated Circuits" wherein silicon waveguides also serve as the bed for the functional semiconductor devices integral with the line posing excellent possibilities of low cost millimeter functions for next generation electronic systems. Dr. Jacobs complements his highly productive research career with a second vocation as Chairman of the Department of Electrical Engineering at Monmouth College, West Long Branch, N .J. He organized the Department in 1957 and has since developed the curriculum into a certified MS degree status. He received the IEEE Fellow Award in 1967 for his semiconductor contribution, and the Secretary of the Army's highest civilian award (Decoration for Exceptional Civilian Service) in 1969 for his millimeter wave and imaging innovations. He was credited with approximately 54 publications and 20 patents. 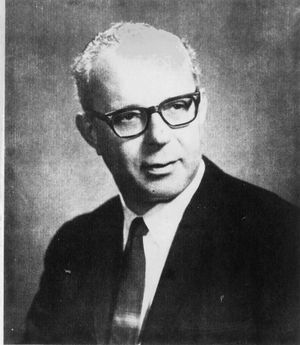 For the period 1960-1972, Dr. Jacobs served with distinction as Chairman of the Army Laser Advisory Group, and as Army member of the DOD Special Group on Optical Lasers; he chaired the 4th National DOD Conference on Lasers and Laser Applications in 1969. He was Chairman of the IEEE Group IV Materials Committee and a member of several other technical committees. He was a member of the American Physical Society and the American Society for Engineering Education. He has at various points on his career also served as Army or US delegate to NATO committees and international conferences in his specialty fields. Dr. Jacobs resided in West Long Branch, N.J. with his wife, Lydia. They had four children: Mrs. Sue Miller of New York City; Glenn, who did graduate work at Rutgers University in Sociology and was also a lecturer at Monmouth College; Steven, a math student at Monmouth College; and Maura. Dr. Jacobs enjoyed handball, swimming, and cross country running with his sons.